One year after becoming the president of Walt Disney Animation, David Stainton greenlit the first feature under his tenure Meet The Robinsons and its long road to the big screen began in 2004. Stainton was transitioning the mouse house away from traditional animation and into 3D CG projects — which his first order of business was scrapping the already in production 2D animated project A Few Good Ghosts to opt for Robinsons. Meet The Robinsons was originally scheduled for a 2006 release, but Disney acquired Pixar in early 2006 and appointed Pixar co-founder John Lasseter as chief creative officer at Disney Animation — who replaced David Stainton. After viewing a rough cut of Meet The Robinsons, John Lasseter had 60% of the animation thrown out and redone. Though the budget has been unreported by Disney, estimates are north of $150 million after tossing most of the film and having to re-animate. 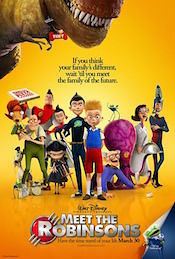 Meet The Robinsons was pushed back to March 30, 2007 and it was booked into 581 theaters equipped for digital 3D, which at the time of release was the widest rollout in the format. The movie opened against the comedy Blades Of Glory in a total of 3,413 theaters and pulled in $25,123,781 — placing #2 for the weekend. A strong $7.1 million of the opening was from the 3D format, accounting for 28% of ticket sales. Meet The Robinsons posted modest weekly declines, but closed its run just shy of the century mark with $97,822,171 — 31% of final gross was from the 3D format. The overseas cume was a soft $71.5 million. The worldwide gross was $169.3 million, leaving the mouse house with about $93.1 million after theaters their cut of the ticket price. This would not even cover the pricey global marketing expenses.